STRONGblog: WebSphere 7 Due in September! WebSphere 7 Due in September! So its already in Beta, and can be downloaded with Rational Application Developer 7.5 public beta. I'm previewing it now to check out the features and to see how it compares to my previous list of 'must haves'. When I was talking with the devs at RSDC, they said that it should go gold in September (but not to quote them.....which I just did). Also, thanks to Davanum Srinivas for pointing us to the direct link for the WAS 7 open beta. 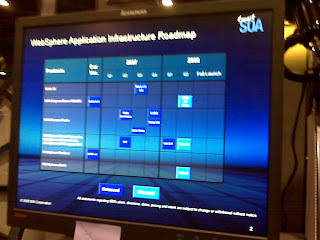 I snapped a picture of their schedule chart, but its a bit too blurry to see it for certain. So these two pieces of software will be what really gets EJB 3.0 into the enterprise space. Too many shops are still using JDK 1.4, and nearly everyone has abandoned EJB 2.1 for more agile POJO based frameworks such as Spring and Google Guice. I am going to venture that EJB 3.0 will only have a marginal growth at best. However, for those IT shops that need distributed, secure, scalability, then the JPA and EJB 3.0 may be your future ticket. RAD 7.5 has some nice Wizards for doing EJB 3.0. I've only started playing with, but I like what I see. Something else coming out of the WAS family, is a rebranding of WebSphere XD. It is getting split into three versions itself. One will be called Compute Grid for distributed grid computing. The second one will be WebSphere eXtreme Scale which will provide high end caching and transaction partitioning capabilities. This product used to be the Object Grid. Another will be called Virtual Enterprise which can be used to manage multiple Deployment Managers, and multiple products (WAS CE, Geronimo, JBoss, Apache Tomcat, WebLogic, even PHP servers). The latter product will be an all encompassing version to manage dynamic workloads, advanced health monitoring, application provisioning, move applications dynamically from one cluster to another, to dynamically role out updates across the grid, and much much more. The theme of this sounds familiar. I believe the refrain goes like this: One ring to rule them all, one ring to find them, one ring to bring them all, and in the darkness bind them. Queue the evil laugh now. There is a wiki available for it and contains a ton of info for the products.